From the beaches on the Indian Ocean to nature reserves on the plains, Kenya has always been attractive to tourists. Kenya Travel and Tourist Information with links to official travel and tourism websites and state resources for visitors to Kenya. Bamburi, Kenya Safaris, Kenya Tourism, Malindi, Map of Kenya, Mombasa, Mountains & Lakes, Nairobi, National Parks, Travel Tips, Visiting Kenya. Countries neighbouring Kenya (which has the Equator running through it) are: Tanzania, Uganda, Sudan, Ethiopia and Somalia. The Massai came to Kenya with their cattle herds, from the region north of Lake Turkana, in the 17th century. The official language of Kenya is Swahili, although English is widely spoken. There's something for everyone visiting Kenya. Amboseli, Tsavo, and the Masai Mara are excellent for game viewing with dense populations. The North, around Samburu and Turkana are off the beaten track and an anthropologist's dream. The coast offers glimpses into an ancient Islamic trading culture at Lamu and Malindi, and fabulous beaches for skin diving. The climb up Mt. Kilimanjaro takes several days, but is worth reaching Africa's highest. The popular image of safari, especially in the west, is inseparable from Kenya. Kenya has over 50 national parks and game reserves where wildlife is protected. To help you make decide which Kenyan Safari is right for you, Andrew Muigai writes about some of the choices for Travel Notes. Take time out for this one - an extensive resource of information about Kenya. Tsavo National Park and Marsabit National Reserve are the country's two largest national parks, although the Masai Mara park, in south-west Kenya, is probably the best-known and most visited. Discover Kenya's national parks and reserves. There are mountains and lakes in Kenya too. Mount Kenya is over 5,000 metres high, and although Kenya only shores a small portion of Lake Victoria, it does contain most of Lake Turkana (Lake Rudolf) in the north east. Nairobi was founded in the late 1890s, by the British, as a railhead camp on the Mombasa-Uganda railway; and became the capital of independent Kenya, in 1963. The Nairobi National Park, on the south-eastern outskirts of the city, is a major tourist attraction. The National Museum of Kenya has an interesting display of early humans in Africa, while the McMillan Memorial Library, also in Nairobi, has a special collection of Africana. Other points of interest include the law courts, the City Hall, and the absorbing Municipal Market. Nairobi is also home to the Kenya National Theatre and Sorsbie Art Gallery. 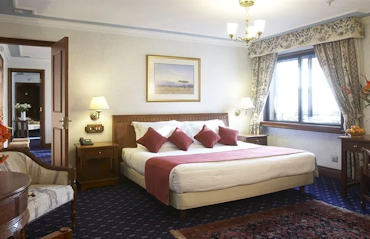 Find hotels in Kenya with special online rates. Fairview Hotel Nairobi - Bishops Road, PO Box 40842, Nairobi, Kenya. Established in 1946, the Fairview is a charming colonial-style mansion with 40 hotel rooms, lush green gardens all around the property and a refreshing pool to swim in. 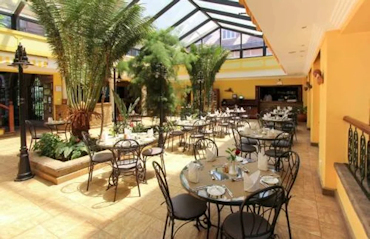 Guests at the Fairview Hotel Nairobi rated the stunning pool, large bathrooms and superb dining. Ole Sereni Hotel Nairobi - Mombassa Road, Nairobi, Kenya. 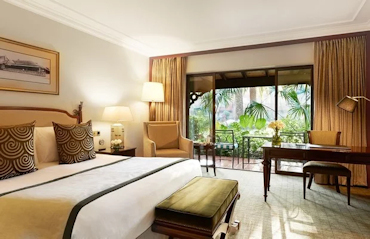 The Ole Sereni Hotel Nairobi is a luxurious 5-star hotel with individually decorated guestrooms and is the only city hotel in the world bordering a National game park. Guests at the Ole Sereni Hotel Nairobi liked the very modern, clean rooms and fantastic bar. Sarova Stanley - Kenyatta Ave Po Box 30680, Nairobi, Kenya. Sarova Stanley, launched in 1902 as the first luxury hotel in Nairobi, offers Victorian-style, 5-star accommodation in a cosy atmosphere. 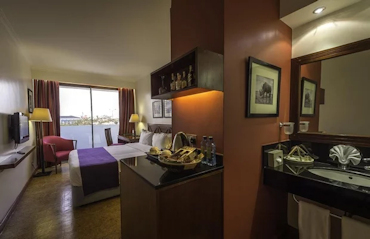 Rooms are spacious with views overlooking downtown Nairobi. Sarova is one of the largest hospitality brands in East Africa. Guests at the Sarova Stanley enjoyed the fantastic bar, beautiful decor and relaxing at the rooftop pool after an East African safari. Fairmont The Norfolk - Harry Thuku Road, Nairobi, Kenya. Set in its own tranquil gardens, a short distance from the city centre, The Norfolk is part of Kenya's history. Built in the early 1900s, the hotel has kept pace with the times and offers quiet, elegant, comfort and cuisine of the highest standards. Guests at The Norfolk enjoyed the fine dining and comfortable rooms. Mombasa, just south of the Equator, is Kenya's major seaport and serves Ethiopia and north-east Tanzania as well. It is also an important cultural centre and famous beach destination for foreign tourists; many escaping the long, cold, European winters on a vitamin D rich, beach and safari package holiday. The Fort Jesus Museum, in Old Mombasa, houses much of Mombasa's history collection in a 16th-century, Portuguese fort. Nyali, Bamburi and Shanzu form a chain of beaches as you head north, out of Mombasa. Bamburi Beach Hotel - Mombasa Malindi Road, Shanzu, Mombasa, Kenya. Mombasa's Bamburi Beach Hotel has its own private ocean front, enhanced with a wooden boardwalk area offering picturesque views of the ocean and beach. 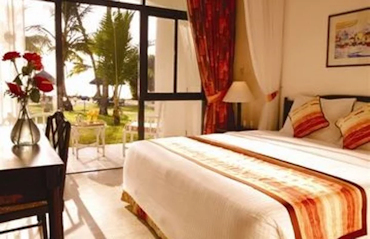 Guests found the Bamburi Beach Hotel, with its clean rooms and stunning pool, to be great value for money. Sarova Whitesands Beach Resort - Bamburi Beach, Shanzu, Mombasa. Whitesands is one of the favourite deluxe resorts on the East African Coast. 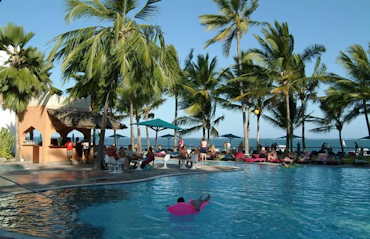 It has the longest beach front and the reception has a distinct coastal feel; with carved archways and murals depicting scenes from Kenya's coast. Guests at the Sarova Whitesands Beach Resort were extremely pleased with the resort's great location and excellent service. Malindi is the second largest coastal town in Kenya, around 2hrs (120km) north of Mombasa, just past the Watamu Marine National Park. Although Malindi boasts 155km of coastline, there are other attractions in the area apart from the beach. Do be careful when walking around in Mombasa and don't go out at night, as it can be dangerous. As in Nairobi, although there was a very visible police presence in the city. On Safari in Kenya don't accept the house special drink on arrival. It's NOT free and very overpriced. The souvenirs are cheaper at the beach resorts than on the safari, be prepared to barter and trade - socks, tee-shirts and pens are all in demand. Don't expect to walk down the excellent beaches, you won't get far without a lot of patience. Be careful of your baggage weight on internal flights and the return trip. They charge excess baggage so try and carry souvenirs in your hand luggage. I would like - Nataka; I do not want - Sitaki. I would like a cold beer - Nataka bia baridi. Coffee - Kahawa; Milk - Maziwa; Tea - Chai. A drink - Kinywaji; Food - Chakula. I cannot eat meat - Siwezi kula nyama. How much? - Bei gani? Money - Pesa / Fedha. It is a reasonable price - Ni bei nafuu; It is very expensive - Ni bei ghali sana. I would like a taxi - Nataka teksi; Please - Tafadhali. Kenya Travel Guides - Kenya Maps.